Brevard College opens its doors to the Scott Concert Hall once more for the 2nd Annual Brevard College Concert Band Invitational on Friday, Feb. 24. High school bands from Brevard, Rosman, Hendersonville, and Asheville will be in attendance, and over 250 student instrumentalists will be on campus. The public is invited and encouraged to attend the performances. The invitational offers participants a unique educational and intensive student engagement experience. 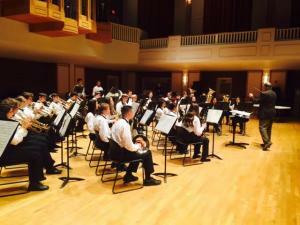 Bands will be given one hour in Scott Concert Hall to warm up, perform and receive 30-minute clinics depending on the length and difficulty of the repertoire. receive a professional audio/video recording of their performance. Featured clinicians include Daniel Galyen, Director of Bands at the University of Northern Iowa, and Reed Thomas, Director of Bands at Middle Tennessee State University. Brevard College Director of Bands Eric Peterson says the goal of the invitational is for the critique to be helpful in each band’s preparation for performance at the North Carolina Bandmasters Association Concert Band Music Performance Assessment March 28-31.